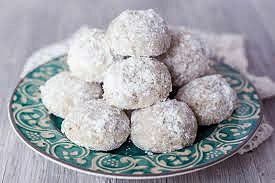 These cookies are rolled in powdered sugar after baking, making white cookies to use for various feasts with white symbolism. These buttery cookies just melt in your mouth. Mix butter, sugar, and vanilla thoroughly. Measure flour by dipping method or by sifting. Stir flour and salt together; blend in. Mix in nuts. Chill dough. Heat oven to 400 degrees. Roll dough in 1" balls. Place on ungreased baking sheet. (Cookies do not spread.) Bake 10 to 12 minutes, or until set by not brown. While still warm, roll in confectioners' sugar. Cool. Roll in sugar again. Makes about 4 dozen 1" cookies.